Solar energy is growing at a rapid pace in China. The country’s National Energy Administration has confirmed that China is on track to see more than 17 gigawatts of new solar capacity installed this year. Many solar projects have received support from the Chinese government and the sector is flourishing because of this support. China is working to distance itself from older forms of energy for the sake of the environment and for economic progress and solar energy has become one of the country’s favored forms of clean power. The initial solar capacity target for this year was 14 gigawatts. 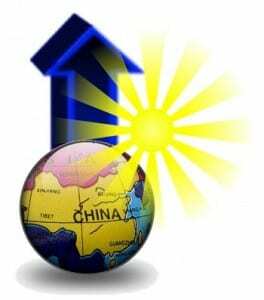 China has been very flexible with its solar targets in the past, regularly increasing its goals because of the accelerated growth of the solar sector. Early in the year, China had increased its solar target to 15 gigawatts and has again upped this goal to 17.8 gigawatts. The National Energy Administration has not provided information concerning how much of this capacity will come from small-scale project or how much will come from utility-scale projects. While China regularly increases its targets for solar energy capacity, it does not always achieve its capacity goals. Last year, the country missed its goal for small-scale solar installations. In 2014, the country had a goal of installing 8 gigawatts of small-scale capacity, but had only managed to reach 2 gigawatts of capacity. Despite this shortfall, the country’s solar energy capacity, as a whole, continued to grow throughout the year, bolstering China’s clean energy foundation. The Hebei Province is where the majority of new solar energy capacity will be installed. The province has a goal of installing some 1.2 gigawatts of new solar capacity, of which 300 megawatts worth of capacity will be associated with poverty relief programs. These programs aim to address the poverty issue in the country, and new solar installations could provide impoverished communities with access to affordable electrical power. New geothermal energy bill introduced in the U.S.